A round, moist, gluten free carrot cake, filled and topped with sweet frosting and finished with a sprinkling of hazelnut pieces. 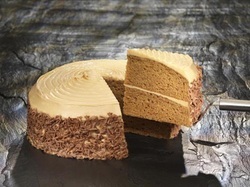 Two layers of a moist, coffee cake with coffee cream and finished off with coffee icing. A round, moist, gluten free chocolate sponge cake, filled and topped with layers of smooth chocolate fudge. 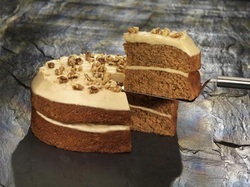 Two layers of toffee cake, with a filling of rich toffee fudge, topped with toffee fudge, then the sides are decorated with toffee curls. Two layers of a moist, traditional cake studded throughout with dates and walnuts. Sandwiched and topped with light toffee fudge. Two layers of lemon cake, studded with pieces of lemon peel and filled and topped with a tangy lemon icing. with a rich fudge icing. Two layers of moist chocolate cake, filled with a rich fudge icing. apples and cinnamon in a butter pastry case.